More on "Why Our Memory Fails Us"
Today the New York Times published an op-ed by Daniel Simons and myself, under the title "Why Our Memory Fails Us." In the article, we use the recent discovery that Neil deGrasse Tyson was making incorrect statements about George W. Bush based on false memories as a way to introduce some ideas from the science of human memory, and to argue that we all need to rethink how we respond to allegations or demonstrations of false memories. "We are all fabulists, and we must all get used to it" is how we concluded. In brief, Tyson told several audiences that President Bush said the words "Our God is the God who named the stars" in his post-9/11 speech in order to divide Americans from Muslims. 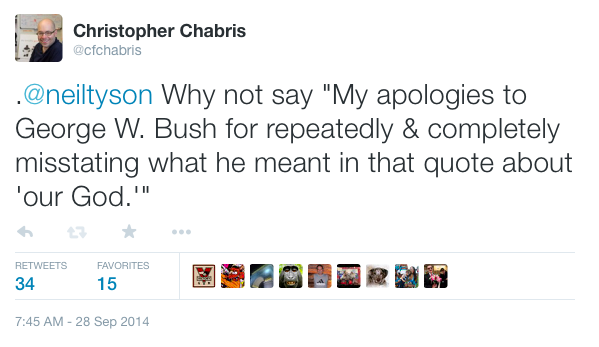 Sean Davis, a writer for the website The Federalist, pointed out that Bush never said these exact words, and that the closest words he actually said were spoken after the space shuttle explosion in 2003 as part of a tribute to the astronauts who died. Davis drew a different conclusion than we did—namely that the misquotes show Tyson to be a serial fabricator—but he brought Tyson's errors to light in a series of posts at The Federalist, and he deserves credit for noticing the errors and inducing Tyson to address them. Tyson first responded, in a Facebook note, by claiming that he really did hear Bush say those words in the 9/11 context, but he eventually admitted that this memory had to be incorrect.
.@neiltyson Why not say "My apologies to George W. Bush for repeatedly & completely misstating what he meant in that quote about 'our God.'" @cfchabris Thanks. Sure, I plan to say something like that soon. I’m looking for a good medium & occasion. A few days later, Tyson issued his apology as part of another Facebook note entitled "A Partial Anatomy of My Public Talks." Hopefully it is clear that we wrote our piece not to pick apart Tyson's errors or pile on him, but to present the affair as an example of how we can all make embarrassing mistakes based on distorted memories, and therefore why our first reaction to a case of false memory should be charitable rather than cynical. Not all mistaken claims about our past are innocent false memories, of course, but innocent mistakes of memory should be understood as the norm rather than the exception. The final version of the op-ed that we submitted to the New York Times was over 1900 words long; after editing, the published version is about 1700 words. Several pieces of information, including the names of Davis and The Federalist—who did a service by bringing the matter to light—were casualties of the condensation process. (A credit to ourselves for the research finding that most people believe memory works like a video camera was also omitted.) We tried to leave it clear that we deserve no credit for discovering Tyson's misquote. In our version there were also many links that were omitted from the final online version. In particular, we had included links to Davis's original Federalist article, Tyson's first reply, and Tyson's apology note, as well as several of the research articles we mentioned. For the record, below is a list of all the links we wanted to include. Obviously there are others we could have added, but these cover what we thought were the most important points relevant to our argument about how memory works. For reasons of their own, newspapers like the Times typically allow few links to be included in online stories, and prefer links to their own content. Even our twelve turned out to be too many.